OXFORD, Miss. (AP) — Nick Fitzgerald’s previous Egg Bowl included a career-altering injury and a crushing loss on his home field. One year later, Mississippi State’s senior quarterback earned redemption. Fitzgerald ran for two touchdowns and threw for another score to lead No. 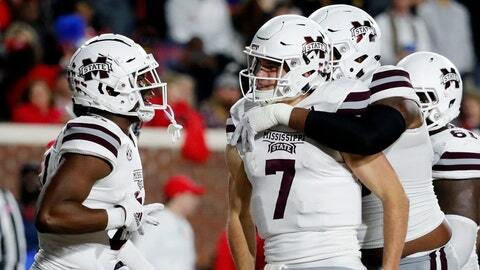 22 Mississippi State over Mississippi 35-3 on Thursday night in a rivalry game marred by a fight that led to four ejections in the second half. The wild brawl was what got most of the attention in the immediate aftermath. All Fitzgerald cared about was a win that felt so good after last year’s loss, which happened after the quarterback dislocated his ankle during the first quarter — a gruesome injury that required several months of rehab. “It felt amazing to know the people who kind of caused it, you get to go to their house, you get to dominate them on their field in front of their fans,” Fitzgerald said. Mississippi State looked as though it would cruise to a fairly uneventful win before Ole Miss receiver A.J. Brown appeared to score a touchdown at the end of the third quarter. Players immediately started shoving, and the fight spilled into the end zone while both benches emptied onto the field. Mississippi State’s Cameron Dantzler, Jamal Peters and Willie Gay Jr. were ejected, along with Ole Miss’ C.J. Moore. Every player on both teams received an unsportsmanlike penalty. Gay was ejected because he already had one unsportsmanlike penalty earlier in the game. Brown’s touchdown was called back because time had expired in the third quarter before the play began. The Rebels didn’t seriously threaten again. Mississippi State first-year coach Joe Moorhead said the fight didn’t take away from the win. “I’m happy as a lark right now,” he explained. “Certainly you don’t want to see that stuff. I really can’t comment on everything that happened because I didn’t see it and I was trying to keep guys on the sideline. We’ll look at the film and see what happened. As for the game, Mississippi State (8-4, 4-4 SEC) won by sticking to what it’s done best all year: running the ball effectively and playing terrific defense. The Bulldogs gained 122 yards rushing in the first quarter to set the tone and built a 14-0 lead by early in the second quarter. Fitzgerald ran for 117 yards on 18 carries. Kylin Hill added 108 yards rushing. Ole Miss (5-7, 1-7) ended the season on a five-game losing streak. The Rebels’ passing offense — which has been among the best in the SEC this season — never got going against the Bulldogs. Jordan Ta’amu completed just 8 of 17 passes for 87 yards and one touchdown. The Rebels were 0 for 10 on third-down conversion opportunities and managed just 189 total yards. It was the first time all season they didn’t score a touchdown. Ole Miss coach Matt Luke said his team’s turnovers and dropped passes were too much to overcome. Luke echoed Moorhead’s statement that the fight was unfortunate. Mississippi State: It was a vintage performance from the Bulldogs, who were fantastic on defense and did just enough on offense. It’s been an up-and-down regular season for Mississippi State, but back-to-back big wins over Arkansas and Ole Miss make it look better. Ole Miss: It was an ugly end to the season for the Rebels. The offense could never get going and the defense couldn’t consistently stop Mississippi State’s running game. Now, Ole Miss will try to prepare for the 2019 season without several of their main offensive stars, including Ta’amu. Mississippi State will wait to find out its bowl destination. Ole Miss’ season is over.